Castle of Torri del Benaco. Discover Lake Garda! The castle of Torri del Benaco east of Lake Garda sits enthroned with pewter walls and three mighty square towers over the picturesque Torri del Benaco village. The impressive castle was built in several attempts. The oldest part of the castle was built on the lakeshore in the 10th century and was commissioned by the Lombard king Berengar II, primarily to protect against the Hungarians. The rest of the complex was built in 1383 at the direction of Antonio della Scala, one of the lords of Verona. It was built on an existing Roman foundation, adjacent to the keep of the former king. Four years later, after only six days of siege, the fortress was conquered by the Visconti, the lords of Milan. It's reported that the population under the rule of Antonio della Scala would have been so impoverished that a change of regime benefited all. Today the fortress is still well-preserved. 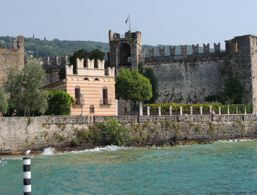 The high wall and the three towers offer a broad view over the rooftops of the old town, the harbour, Lake Garda and a large part of the lake's landscape from Sirmione to Limone. The Scaliger Castle is home to a fascinating ethnological museum, which tells about the sea area and its inhabitants: about fishing, olive oil production and the art of growing lemons. Although the west of the lake is known for its lemon greenhouses, a lemon greenhouse (Limonaia) from 1760 was extensively renovated and planted in the Scaliger castle on the eastern shore. A visit to the Limonaia is worthwhile, especially in the morning. A special tip in Torri del Benaco is a visit to the Osteria Ago e Rita north of the village on the campsite S. Felice. It’s a lively restaurant that has a lovely impact on travellers who like it warm-hearted and unconventional.